Paper and Ink Playground: Happy Birthday, Cupcake!! Want to know how to take a simple cupcake and turn it into a sweet gift? Wrap it up!! Regina, of The Cutting Cafe has created an entire set of Cupcake Wrappers and Sentiments and Holiday Sentiments Wrappers! Here's the card by itself. 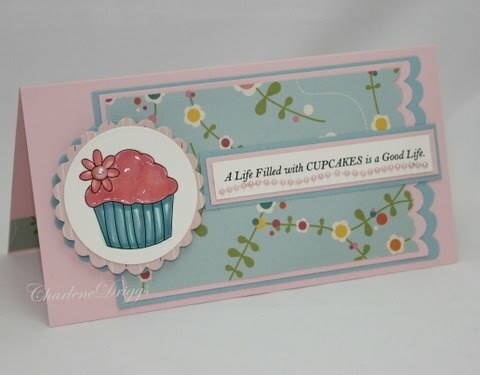 I used the sketch from Posh Designs CSC13 and the All About Cupcakes set from The Cutting Cafe. Very cute! I love how they match and I love the colors you have chosen! This is SO cute! I love the colors and papers you used...makes the cupcake look so YUMMY! Very sweet Charlene! Love the line of pearls under that great sentiment! Sweet and yummy, Charlene! The cupcake wrapper is so pretty; I would just want to keep it!